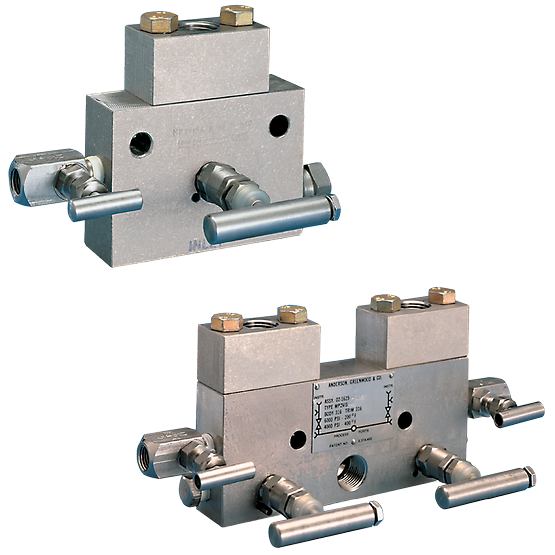 Block and bleed manifold for static pressure measurement devices. Single or dual outlet for local indication for static pressure to 6000 psig (414 barg). Cost savings of 20-30% when manifolding instruments by eliminating several parts used in conventional methods of ‘piping up’. Compact design requires minimum space for operation and installation. Fewer leak points reduce leakage by having fewer parts to assemble. Free-swivelling ball end stem design ensures bubble-tight valve closure without seat galling. Reduced piping costs by mounting two instruments on the same manifold and pipe stand. Immediate installation with AGCO Mount as the manifold, steam block, bracket and all associated piping can be installed without the instrument at the time of plant construction. Secure mounting provided by the AGCO Mount. Instrument piping stability is enhanced when directly supported by the pipe stand through the manifold. All block valve threading is isolated. Packing is below stem threads, body-to-bonnet seal is below the threads minimizing process fluid corrosion. Reduced chance of instrument damage. With the AGCO Mount, the instrument can be warehoused safely until final ‘loop’ checkout.